The single most important decision you will make in the development process of a new seniors housing community is choosing where to build. You can later change pricing, branding, or even the operator, but once built you can never change the location! Which markets have unmet demand for your services? Of those, which are the strongest? Within that market, which specific site should you select? Could a competitor also build nearby? Barriers: High land cost, few available sites, strict zoning, state licensure, etc. Expensive: It can often take significant internal staff payroll and several third-party market studies to find just one good location. 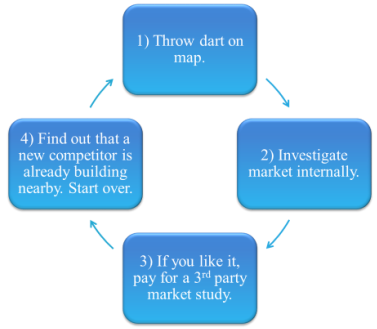 Slow Process: Start to finish, it takes months to identify a single good market and site. Selection Bias: Evaluation is limited to the chosen market/site. You never got to see if there was a better market out there within your chosen footprint. Unreliable: Did you choose a low-price market study firm? How good are the data in the market study? What if the market study was wrong? Cost: Using our mass-modeling techniques, OHC Advisors can analyze huge numbers of specific areas in your footprint at a tiny fraction of the cost of doing traditional, individual market studies. Timing: Speed to market is critical in today's development environment. Our approach evaluates many markets simultaneously, speeding up your due diligence and therefore your development pipeline. The Full Picture: By analyzing many locations in your footprint concurrently, OHC Advisors provides you with a ranking of how each potential location stacks up against all others. Selection bias is removed. Reliability: OHC Advisors uses a quantitative, data-driven process for selecting the best markets for you. First Mover Advantage: Be the first to find and build in a strong market, instead of being just another project in a potentially crowded development market.